Every project manager shares the same basic goal: they want to streamline workflow and eliminate unnecessary or repetitive tasks in order to plan and execute projects as efficiently as possible. However, project managers can choose from several methodologies to get there. If you’ve read our other content about process improvement methodologies, you’ve probably noticed that two schools of thought dominate project management philosophy: the Lean method and the Six Sigma approach. The Lean method stresses the importance of reducing all forms of waste. Six Sigma is a data-driven, tried-and-true project management process. Combine these two philosophies, and you get the Lean Six Sigma methodology. Learn its basic principles below and discover whether Lean Six Sigma will improve the efficiency of your team. Since 1986, Six Sigma has been the quintessential project management method with its belt-based certifications. Typically, Six Sigma uses a five-step approach to solving issues, either the DMADV or DMAIC methodology. Ultimately, the goal is to reduce product variations and defects using statistical analyses. As happy as businesses have been with Six Sigma, many began to wonder how they could improve the process. The Lean method is a philosophy centered around eliminating waste and providing the best customer experience. According to the Lean method, there are eight kinds of waste: defects, overproduction, waiting, non-utilized talent, transportation, inventory, motion, and extra processing. So what happens when you turn up the heat and combine best practices? For a process stream that produces the best results, consider the following Lean Six Sigma principles for your organization. One of the oldest, yet most prudent, pieces of business advice holds true today. No matter what business you’re in, you should always put customers first. Everything should revolve around your customers and their needs. After all, without customers, where would your organization be? Before you start making any drastic or even minor changes, establish the level of quality or requirements that you have promised your customers. Every decision you make should bring your company closer to delivering maximum value. You need to see the current state of your process before you can move forward and make improvements. Identifying value stream is indisputably what makes Lean Six Sigma principles so effective. It's how businesses visualize all of the steps in a given process and highlight areas of waste. How do a few pieces of plastic and glass on an assembly line ultimately become a 4K television? 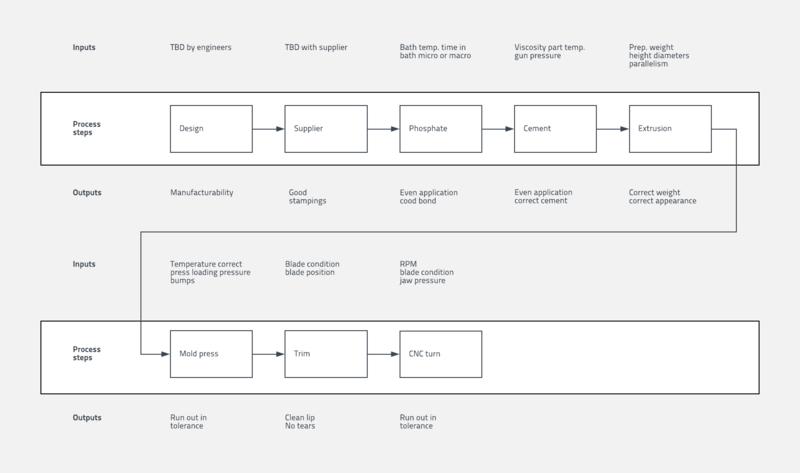 A value stream map showcases every single step, including purchasing parts, assembling them (and checking for quality assurance), and distributing the finished product. From there, your company would determine which steps add value and which do not (and can, therefore, be removed from the process). Want to create your own value stream map? 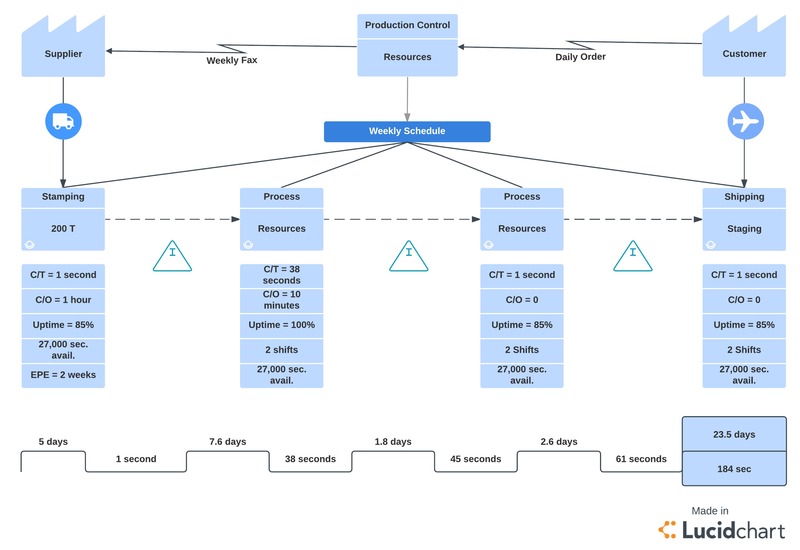 Read this blog post if you’d like us to walk you through the entire process, or get started right away with the value stream map template below. Once you have put together your current value stream, you can identify the problems with your workflow and solve them. Remove any non-value-added activities or opportunities for defects. On your value stream map, avoid highlighting areas that are working fluidly. True, it’s important to showcase successes and wins for employee morale and building company culture. However, Lean Six Sigma methodology is about finding where problems arise, fixing them, and preventing future occurrences. 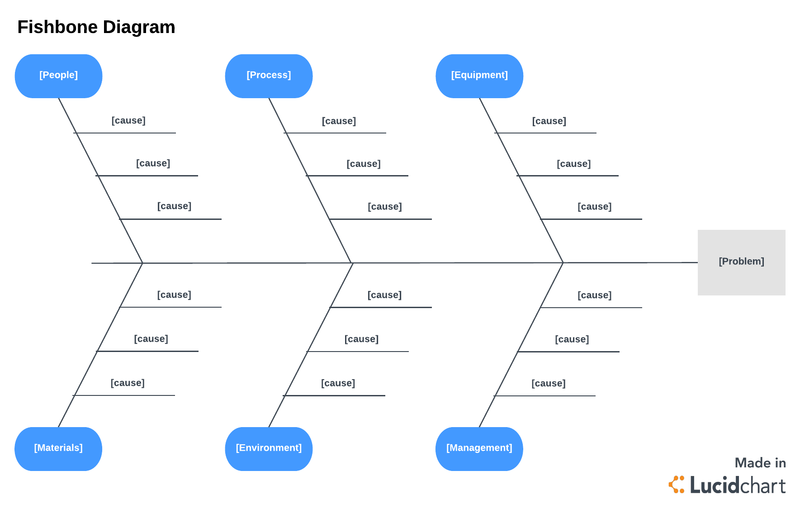 If your value stream map doesn’t clarify exactly where the problem lies, you can use several other diagrams to work through potential root causes of the issue. Cause-and-effect diagrams, also known as fishbone diagrams for their layout, can help you identify problems within different areas of your business. For example, service industries typically look at the four p’s—policies, procedures, people, and the plant/technology—to find potential causes. If you want to involve your team, you can also brainstorm issues with an affinity diagram. The law of inertia states that an object at rest or moving at a constant speed will remain at rest or keep moving, unless it is acted upon by an external force. The same applies to your organization: nothing will change until change is enacted. Workers will keep performing (or not performing) the same tasks until management decides otherwise. The onus is on the business to effectively, clearly communicate new standards and practices. Be sure each employee receives training and feedback. Otherwise, why expect the problem to change? You can use Lucidchart to create a simple process map that clearly shows your employees what has changed about their workflow (add swimlanes to delineate responsibilities by team or employee). Customize this process map template with your own workflow. As you can tell from the other principles we’ve discussed, Lean Six Sigma requires a lot of change. You need to welcome change and encourage your employees to accept change as well. Put yourself in the shoes of your employees—hearing that one’s job has been automated or certain duties have been removed could cause them to panic. However, you can dispel fears by explaining the benefits of the change and show employees how you have made their work more impactful. As part of this cultural shift, your company should always look for new ways to streamline the process and remove waste. Keep your eye on the data, examine your bottom line, and adjust your processes where necessary. Lean Six Sigma methodology captures the best of both Six Sigma and Lean methods of project management. If you decide to follow this methodology, follow the Lean Six Sigma principles and optimize process improvement once and for all.